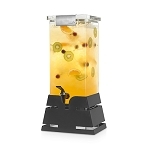 Lovely wood meets with clear acrylic and a black matte steel base to create a product you will love. 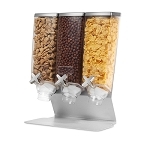 This Table-top Dispenser with Walnut Tray will look fabulous on a breakfast buffet or in a yogurt shop filled with toppings. Nuts, granola, cereal, candy, and more will be protected in this candy dispenser. The patented portion control wheel on this countertop dispenser gives one ounce of product per turn, which keeps counters clean and tidy. 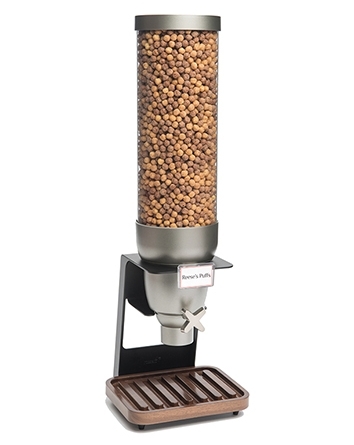 Less waste when using this dispenser means more profit for your shop. Order one, or a few, for your shop or buffet station and watch as customers line up for their favorite treats and come back for more! Get yours today at All Candy Containers.